I was very pleased to snag a last minute returned, lone available ticket to the European premiere of this on Saturday as I'd heard a lot of great things about this film and it had been sold out. 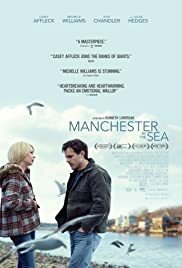 The premise is simple: when his brother Joe dies, Lee Chandler (Casey Affleck) is forced to take care of his teenage nephew in his hometown, from which he moved away years earlier to escape his demons from a trauma years earlier. It becomes clear early on that Lee had life figured out years earlier. The film jumps between the past and the present, revealing a time where Lee was married, spent a lot of time with his friends and family (especially his brother and his nephew) and was content with life. But while jumping between the two periods of time, the film travels along at a slow, tense pace, tentatively revealing facets of Lee's past and present personalities (which are remarkably different) before hitting the audience with the full force of what exactly what made him run from his hometown. Casey Affleck is astonishingly good and it's no wonder that there is a strong early buzz around his performance. He essentially plays two different characters, a man before trauma and a man after. The 'before' in flashbacks is fairly simple, a relatively friendly and happy-go-lucky guy who spends a lot of time with his friends and family, has a close relationship with his nephew, etc. But where he excels is in the quiet desperation of the present-day Lee Chandler. With this character there are only rare moments of outward emotion - but Affleck plays it so that it is painfully clear just how much hurt Lee is keeping inside. Best Actor Oscar nomination, and highly possible win, incoming. Despite the serious subject matter, there is a surprising warmth that permeates the film. 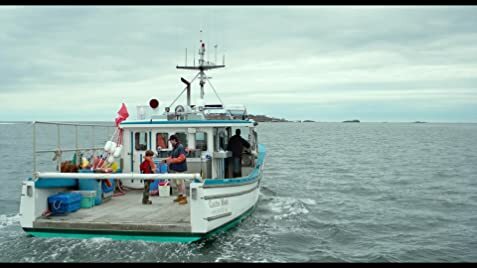 This is a film primarily about a man forced to confront his demons, yes, but it is also a film about family and the ties that bind us to our hometown. There is a terrific chemistry between Affleck's Lee and Lucas Hedges, who plays his nephew Patrick. Make no mistake, despite its subject matter this film is often hilarious, with the dialogue between Lee and his nephew providing most of the frequent outbursts of laughter in the cinema. Owing to his detachment and fear, Lee is fairly useless as a caregiver to Patrick, who in turn pushes his limits in being allowed to do whatever he wants (mostly chasing girls - there are particularly hilarious scenes when he is trying to get laid). Affleck's Lee is also forced to confront his demons in the form of his now ex-wife Randi, played by the ever-brilliant Michelle Williams. It's actually a relatively small part, but a key one, with an especially important scene that is played beautifully by both Affleck and Williams. In the Q&A that took place before the film, Williams talked about how she had spent 15 years wanting to work with 'Kenny' Lonergan, the director, as he is such a beautiful writer, and so she jumped at the chance before she'd even really heard detail about the part. And it's clear to see why she would be so desperate to work with Kenneth Lonergan, whose writing and directing for this film is gentle, warm and heartbreaking in one package. It's bleak, but hints at hope. It's understated, but breaks out in small moments of agony without overdoing it (the middle of the film is particularly gut-wrenching). I would be very surprised not to see nominations in his direction also. Beautiful writing and directing from Kenneth Lonergan, and a stunning performance from Casey Affleck in particular. It's a beautiful, quiet picture encapsulating trauma, guilt, redemption and familial bonds. 174 of 285 people found this review helpful. Was this review helpful to you?